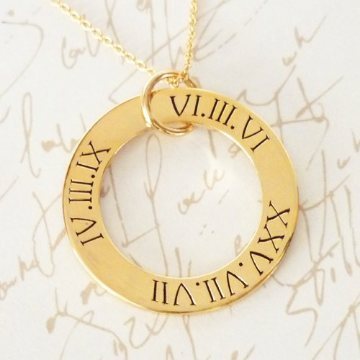 Roman Numerals are one of the hottest personalised jewellery trends right now! Customise a piece of jewellery for someone special (i.e. yourself!) with meaningful numbers or dates and have a short message engraved on the back if you wish. Your stunning Roman Numeral jewellery not only comes gift-boxed, but with a polishing cloth to keep it looking gorgeous. Our image shows three birthdates in shortened format (clockwise from top): 6.03.06, 25.07.07, 4.03.09. Displayed cost is for a SMALL, vermeil gold pendant (vermeil is a heavy, long-wearing 18kt gold-plate over sterling silver), with engraving both sides and 45cm (18 in) gold-filled chain included. Don't know your Roman Numerals? Use our handy conversion tool! NOTE: Dots (full stops) and spaces must be included in your character count. You don't have to use every "line" available for your engraving; your numbers / words will be distributed evenly around the pendant.